Bridge Mill Autos for new fitted exhausts Alverthorpe Wakefield. West Yorkshire. 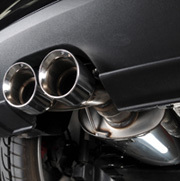 We supply and fit exhausts to most make and models of vehicles incl Mercedes, Ford, Peugeot, Vauxhall, BMW. Call us now for a competitive quote on Tel: 01924 375686. We have all the exhausts from the major manufacturers that enables us to offer you the best price on a new exhaust for your car or van. We are very competitive on all our exhaust systems so please call Bridge Mill Autos Alverthorpe Wakefield before you try anyone else. All our exhausts are fitted by qualified professional mechanics using all the latest tools and equipment to ensure a smoth running of you vehicle. An old exhaust that is leaking or blowing can ruin the fuel economy and performce of your vehicle. Your exhaust emissions system is the only means of channelling away those noxious fumes, like the environmentally destructive gas carbon monoxide, generated by your engine. A failing exhaust will lead to poisonous fumes being drawn into the vehicle cabin and prolonged exposure to exhaust fumes can make a vehicle occupant feel drowsy, which could lead to an even greater danger. A healthy exhaust system is critical if you are to maintain the health and welfare of the vehicle occupants, a quiet smooth running engine and optimum fuel efficiency. If you have any concerns regarding the health of your vehicles exhaust system then call in today. So don't delay and call Bridge Mill Autos on Tel: 01924 375686 TODAY.